Spalding NBA Gold series outdoor basketball Size 29.5"
Molten BGM7X FIBA World Cup Qualifier Basketball size 7 - 29.5"
Spalding TF-250 composite leather basketball brick black size 29.5"
Spalding Highlight Gold premium rubber basketball size 29.5"
Wilson NCAA street composite leather Basketball 28.5"
Spalding Force Basketball outdoor blue size 29.5"
Spalding 2016 All Conference Basketball Intermediate Size 28.5"
Trending at $23.26Trending price is based on prices over last 90 days. Spalding NBA Mini Basketball 22.5"
Spalding NBA Silver series in/out composite Basketball size 29.5"
Spalding NBA Replica Neverflat Composite 29.5"
2 product ratings - Spalding NBA Replica Neverflat Composite 29.5"
Mikasa 1000 rubber premium Basketball Size 29.5"
Spalding basketball NBA Silver series outdoor size 29.5"
Mikasa 1312C rubber Youth basketball size 27.5"
Spalding Highlight Blue premium rubber basketball size 29.5"
1 product rating - Spalding Highlight Blue premium rubber basketball size 29.5"
Trending at $32.02Trending price is based on prices over last 90 days. 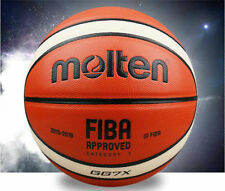 Molten BGR7 World Cup premium rubber Basketball size 29.5"